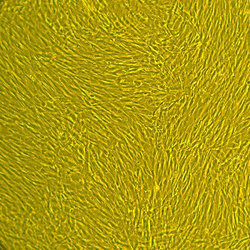 Lifeline® normal Human Uterine Fibroblast Cells, when grown in FibroLife® S2 Medium, provide ideal In Vitro models for Uterine contraction and relaxation studies, Uterine cancer studies, general Uterine biology studies and specific responses to estrogen, progesterone, relaxin, oxytocin and other female reproductive hormones. Lifeline® Human Uterine Fibroblasts have been plated and expanded in culture vessels twice before being harvested for cryopreservation to ensure the highest purity, viability and plating efficiency. Our uterine fibroblasts are quality tested in FibroLife® S2 or FibroLife® Xeno-FreeTM Medium and demonstrate optimal growth at rates equal to or greater than classical serum-supplemented media. These media support the growth of our cells over a period of at least 15 population doublings. Lifeline® uterine fibroblasts need not be exposed to antimicrobials or phenol red when cultured in FibroLife® Medium. It has long been established in the literature that phenol red acts as a weak estrogen in cell culture media and may stimulate estrogen receptors. This can cause masking effects that could negatively affect studies with human female reproductive cells.